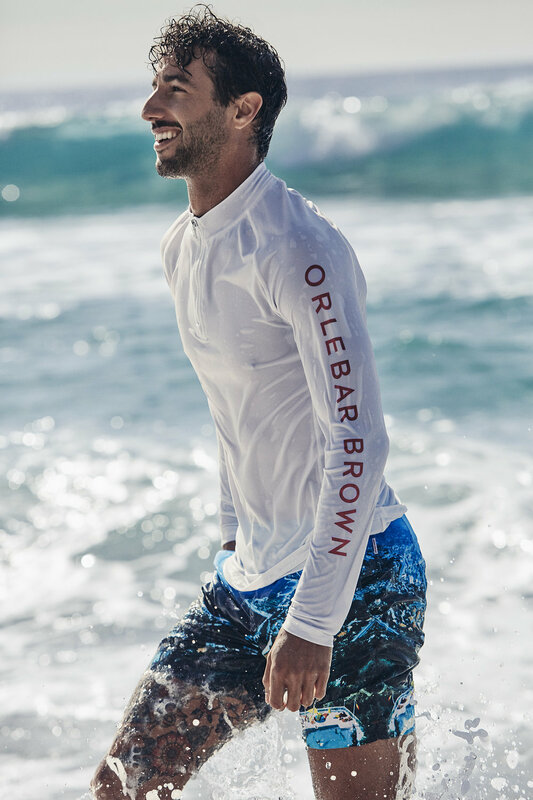 Fresh from a new Summer Sport collection, Orlebar Brown has collaborated with Australian racing driver Daniel Ricciardo on a new three-piece collection of swim shorts. The collection takes the familiar OB tradition of luxury fabric with vibrant print and the #SnapShorts initiative for two of three limited editor shorts featuring prints of Monaco and Texas and the third, a one off Americana inspired print. The shorts that have been a special treatment are Orlebar Brown’s superb Bulldog style which are the most popular, mid-length designs. Speaking of the new collection, 28 year old Ricciardo says “I was inspired by places I’ve travelled mostly—they’ve left me with great memories. I live for the summer and it makes me happy on so many levels, so my swim shorts are genuinely some of my greatest pieces of clothing.” The collection uses Orlebar Brown’s classic Bulldog style and are given the Ricciardo treatment inspired by some of his favourite destinations; Monaco and Austin. Available now at Orlebar Brown.